What happens to important projects when an employee goes on emergency leave? Joe Employee is up to his eyeballs in a particular must-do/can’t fail project. His knowledge and expertise are the foundation on which the project is based. Without him, the deadline would likely be missed and the company profits would suffer. The project is going along fine, still on track, when Joe unexpectedly asks for time off due to a family medical emergency. Now what? What will be the fate of the project? Who can step into Joe’s shoes and keep it on track? Joe was unable to update company management on the status of the project prior to taking leave. Joe has no legal obligation to provide such information while on leave. Apparently, Congress and the DOL intended the Family and Medical Leave Act (FMLA) to be a cooperative and beneficial exercise for both the employer and the employee. The need for effective communications between the employee and employer is recognized in making arrangements for continuation of work in progress when the need to take FMLA leave becomes known. Employees often worry about how to get work done, and realize the importance of the work to the business. Of course, pre-planning for such occurrences can help, but it does not always take place. Since this particular quandary is not specifically addressed in the regulations, it is expected that the employer and employee will cooperatively resolve the issue to their mutual benefit. The employer is not expressly prohibited from contacting the employee during FMLA leave to inquire about work-related matters. 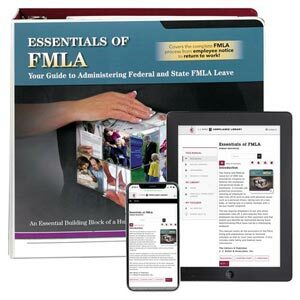 While you may not mandate that Joe work during FMLA leave (otherwise it wouldn’t be leave), you may ask about the project status and progress, and any information Joe might have to pass along to others who can step in and take over in his absence. Joe might also have insight into who might be adept at carrying on in his stead. You may not deny Joe Employee FMLA leave as long as he is eligible and the reason qualifies. Nor may you coerce him into cutting his leave short to get back to the project as soon as possible. If you believe Joe is a key employee, he is still entitled to FMLA leave, but might not be entitled to reinstatement if doing so would cause grievous economic injury to the company. Joe would also need to meet the key employee criteria. While Joe’s leave might represent a setback in the project, the damage could be minimized if you keep the lines of communication open.